Nature is injured… today, wafts of her pain drifted sixty-five miles to remind of her peril. Eyes tear, breath is stifled as smoke from the Eagle Creek wildfire burning in the Columbia Gorge National Scenic Area is carried west in the winds. 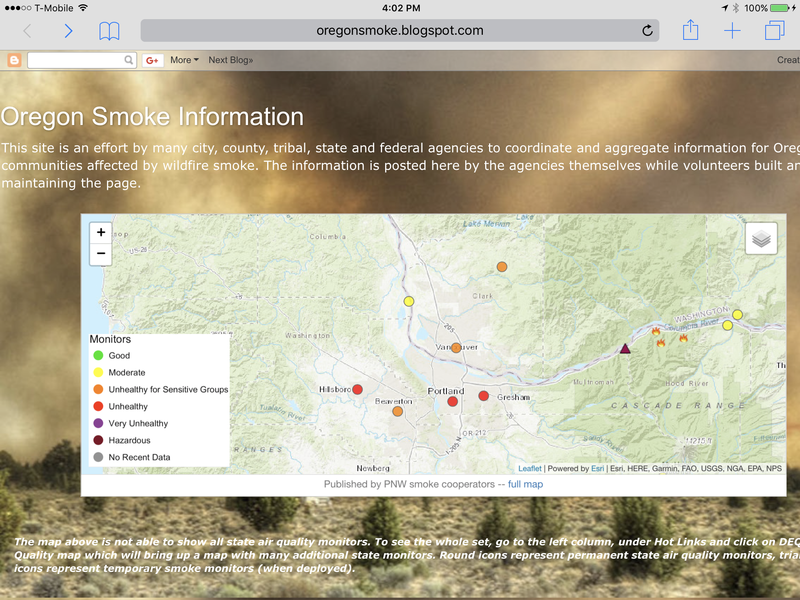 Data on the Oregon Smoke Information map is not good. 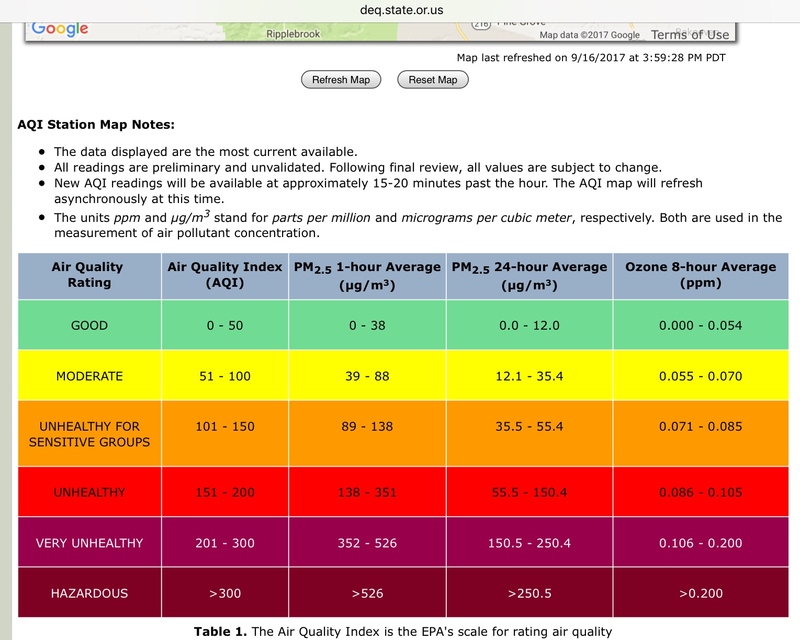 The air quality where I live, in Hillsboro, is unhealthy. The smell of burnt trees lingers all day. The sun rose and set today- each distorted by an eerie film of smoke. down the Gorge and west. Much anticipated RAIN! The Inciweb report this morning is cautiously optimistic. As fire dangers decline… new hazard warnings arrive on the shoulders of rain. A cold front moved over the fire Sunday night, bringing significant precipitation. Showers, heavy at times, are predicted Monday and Tuesday, with another significant front moving over the fire Wednesday. As precipitation falls across the fire new hazards may emerge, including falling rock and trees on steep slopes and cliffs. If heavier precipitation hits later this week, debris flows are possible in smaller streams and channels. A break between rain events. Look how the rains have rinsed away the smudge of smoke from the air in Hillsboro. 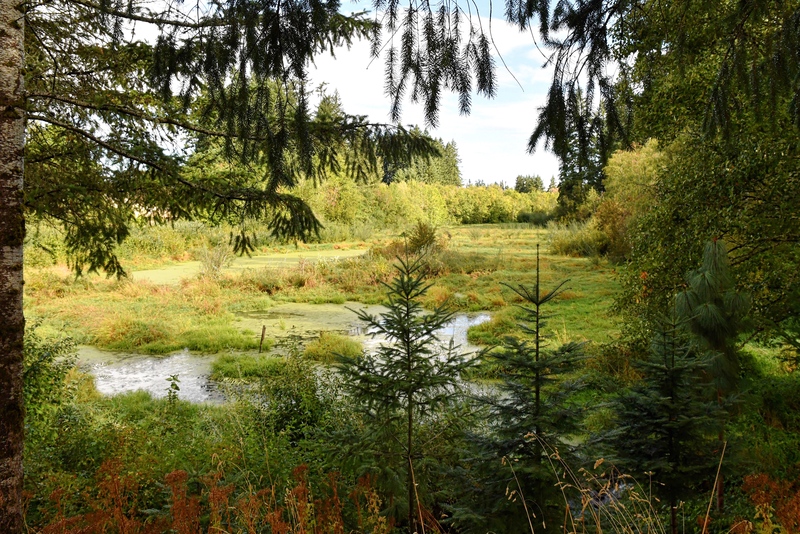 Fresh air is back on Glencoe Swale and throughout the region. This is good news. 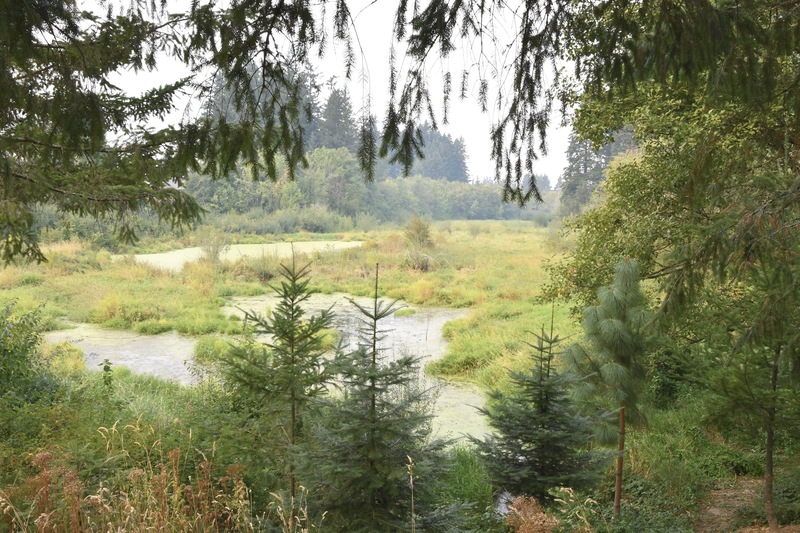 The toil of nearly a month of intense wildfire-fighting is eased with the help of Nature. I admire Her determination to heal. … having to pay attention to managing fire breaks, cutting out scrub etc. Drought plays right into the hands of that fire hungry beast. It’s doubly devastating when fires are caused deliberately. Hope nature’s regenerative powers balance and heal the wounds and in your words ‘we will marvel’. This sounds so devastating Jane. Sorry to read of the extent and areas affected. Fire is a terrifying beast when it ravages unabated – the rain was timely in it’s coming. It’s awful when mature forested areas are destroyed if they’re systems not dependent on fire’s restorative powers. So sad to lose mature trees. So many lessons to learn, Liz. And… often with such an enormous up hill climb… when the ones who refuse to learn create steps backward. To Nature’s credit… little plants sprouting were shown in a news feature the other night. Just in time to begin holding a little bit of the soils in place as the fall rains start. Many areas remain closed to the public due to tree damage hazards and landslide hazards. Thank goodness for the rain. We were taking about this last night at dinner. So many lush and beautiful areas affected. Looking at you maps, I am wondering if the area around Multnomah Falls was compromised? Enjoy some fresh air , for now. Donna, thank you for taking out your maps, and feeling concerned about this beautiful National Scenic Area. Yes, the area where Multnomah Falls are located is in the fire zone. We are very grateful to the many agencies that were on the scene and gave special priority to saving the lodge and close surrounding area. News tonight is that crews are down from a thousand or so responders to a crew of about one hundred, and the fire is over 50% contained with more heavy rain expected to further douse hot spots. I dread seeing the damage when the area is open to the public again… I anticipate the sorrow. However, Nature has her way of recovering – to that, We will marvel. Oh, what wonderful news, Jane! The difference in the photos is amazing. 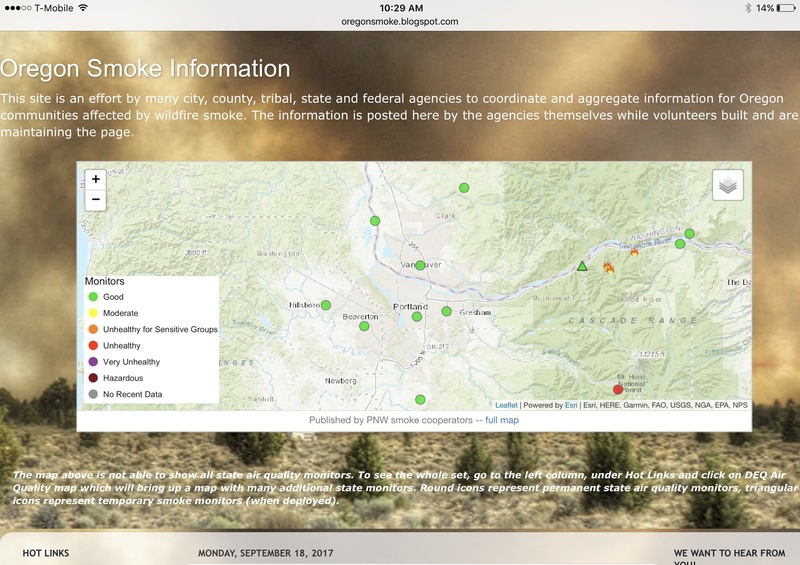 I know about smoke from being in Wyoming when there are fires elsewhere and from the one year we had to evacuate “just in case.” May it rain on all the fires as quickly as possible! I hope you heard it. We got some much-needed rain last night, but not very much. We could use more. Nicely done, Jane! I even washed windows today to celebrate the clean air!!! Reblogged this on Friends of Glencoe Swale.